Pressure is probably the most frequent association with glaucoma. The effect of pressure—intraocular pressure (IOP)—however became under question when larger studies in patients with glaucomatous disc excavation and glaucomatous visual defects demonstrated that this clinical manifestations can also be present in patients with “normal” IOP. This is true for at least 30% of patients with primary open-angle glaucoma in the western hemisphere and for up to 90% of open-angle glaucoma patients in the Far East [1, 2]. Such observations stimulated the research for alternative mechanisms that could help to explain glaucomatous damage to the optic nerve. One direction of research focused on vascular dysregulation . 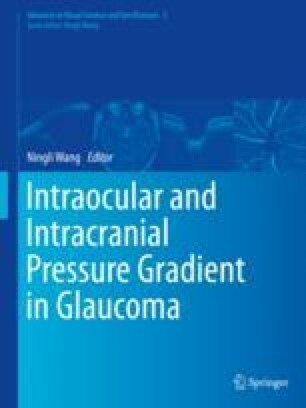 The current research topics are the concept of the translaminar pressure gradient defined as intraocular pressure (IOP)—intracranial pressure (ICP) [4–7]. The intraorbital optic nerve is located within the subarachnoid space (SAS) of the optic nerve (ON) and therefore completely surrounded with cerebrospinal fluid (CSF). The SAS itself is confined by the meninges (dura, arachnoid on one side, and the pia mater on the other side) (Fig. 11.1).